Some traditionalists will cry when I say it, but liquid smoke (L.S.) is a very safe and useful flavoring for sausage making. Not every sausage maker wants to go to the added trouble and expense of building or buying a sausage smoker. Some people, for whatever reason, don't want to use nitrite cures in their sausage. L.S. allows us to give even fresh (uncured) sausage a nice smokehouse flavor...no curing needed. There are some things L.S. won't do though. ...It won't give your sausage a nice brown "smoked" color. ...It does nothing to preserve your sausage. ...It will not cook your sausage like a smoker can. You will have to use an alternative cooking method (like a hot water bath) for cooked sausage that gets its smoked flavor from Liquid smoke. The process for making L.S. is quite straight forward. Wood is burned and the smoke is caught in a collector. When it condenses, the result is a liquid with a very strong smokey flavor. An added benefit is that most of the tar and ash found in the wood smoke is left behind. You can make your own L.S. 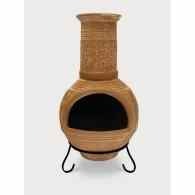 by burning wood in a tall chimenea (one of those clay Mexican fire pits). Put a round bunt pan on top of the chimney so the smoke rises through the hole in the middle of the pan. On top of the bunt pan put an inverted pie plate, and on top of that put a bag of ice. The smoke will rise through the center hole of the bunt pan, hit the cold pie plate, condense, and run down the sides of the plate into the bunt pan. It's much easier to buy commercial L.S., but you can see from the process that there really isn't anything in it that is unsafe. I buy my L.S. from a sausage supply house (cheaper), but it's a common product and easily found at the supermarket. Look in the section with the meat sauces and marinades. This is a very strong flavoring. Be careful with it or your sausage might taste acrid and burned. Too little is way better than too much. If a recipe calls for L.S., just follow the directions. You can always add or subtract in the next batch to suit your own taste. If you are experimenting with a recipe that doesn't already include L.S. I recommend starting with a teaspoon for each 5 pounds of meat. For those of us who don't want to go through the extra bother of smoking our sausage, or who don't want to use a cure, liquid smoke makes a lot of sense. I don't use it in all my sausage, but I do use it. I like the results and the convenience.